Divided Harmonics is a Moscow-based musical collaboration between Sasha Martinsen and Paul Bokov (owner of Gliese 581C Records also known as Wrong Mantra). 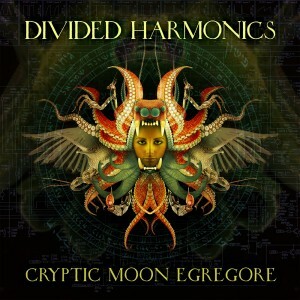 Their long-awaited full-length album Cryptic Moon Egregore is a result of a several-year-long special trippy sound development, expanding the traditional idea of downtempo music. Finalized material represents deep multilayered stuff that was the initial goal from the foundation of the band. Melodies coming from the unknown depths. Good album. can we please talk about how psychedelic this is? I don’t like the talking on tracks 1 and 5, but otherwise the music is enjoyable. I still don’t like tracks 1 and 5, but the other four tracks are VERY trippy. Awesome sounding music and cool album cover! Thank you.